There’s an epidemic in West Africa, and the dreaded “E” word is on everyone’s lips and keypads. But here’s a question: does the devastating disease deserve its capital E, and if so, why? When we write about salmonella or influenza (or flu for short), diabetes or rabies, we don’t crown the names of these deadly scourges with capital initial letters. 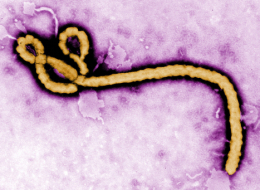 Why does Ebola get special treatment? The AP Stylebook explains it simply: “Capitalize a disease known by name of person or geographical area: Alzheimer’s disease, Parkinson’s disease, Ebola virus.” Ebola was named after a tributary of the Congo River in Zaire (now called the Democratic Republic of the Congo), near which the virus was first identified, so it can claim its status as a proper name for life. And how should we pronounce the name of this awful virus? According to NPR’s standards and practices editor, Mark Memmott, as posted on NPR’s Tumblr, it should be “ee-BOH-luh” (rather than “eh-BOH-la”). But as Memmott advised in his internal memo to NPR colleagues: “It’s important to note that this is guidance, not a dictate from on high. We want to say things correctly, but we also realize that we have correspondents from around the world and that when they speak they may say some things differently. In this case, NPR’s Ofeibea Quist-Arcton is from Ghana. She says ‘eh-BOH-la.’ It’s natural to her. We wouldn’t want to try to force her to say ‘ee-BOH-luh’.” Ebola means “Black River” in Lingala, the language of the DRC’s northwestern region where the tributary can be found. But since Zaire was a Belgian colony between 1908 and 1960, the name of the river has probably been pronounced historically in a French way — i.e. “ay-BOH-luh” (with the sound of an acute accent on the initial E), so “eh” probably best approximates how the name’s first syllable sounded when the virus was first identified and named in the early ’70s. Oxford Dictionaries lists both pronunciations (“eh” and “ee”) in its pronunciation guide. For a fascinating history of Down’s syndrome and how it got its name (it was originally called “Mongolism”), read this post on Virtual Linguist. What exactly is the difference between epidemic and endemic? Although they’re often confused with each other, they have distinctly different meanings. Epidemic — although it sounds more like an adjective and can be used as such — is more widely heard in its noun form, meaning “a widespread occurrence of an infectious disease in a community at a particular time” or “a sudden, widespread occurrence of a particular undesirable phenomenon” (OED). So the word is completely appropriate to describe the current outbreak in West Africa, while we can also talk about the epidemic of sexting in teenagers or the epidemic of online identity theft. Endemic is more often heard as an adjective, despite being a noun too, but it is not the adjectival form of epidemic, as is often mistakenly thought. It describes a disease or condition “habitually present in a certain area as a result of permanent local factors; of common occurrence; rife.” And when describing a plant or animal, it means “native to, and especially restricted to, a certain country or area” (OED). So a condition or disease that is endemic isn’t necessarily widespread, rampant or epidemic: the word is focused more on the common and localized nature of the phenomenon than on its prevalence or severity, which might indeed be slight. Pandemic describes “a widespread epidemic that might affect entire continents or even the world: e.g. the Black Death in Europe and AIDS in sub-Saharan Africa.” Thankfully Ebola isn’t yet in this category, although the fear is that it could spread to other parts of Africa (and further afield), becoming the first great pandemic of the 21st century. We all hope fervently that this will not be the case. This entry was posted in Pronunciation, Spelling, Words, phrases & expressions, Yanks vs. Brits and tagged capitalize names of diseases, Down syndrome Mongolism, Down Syndrome or Down's syndrome, Ebola capitalize, Ebola name origin, Ebola pronunciation, epidemic or endemic on October 16, 2014 by Louise. When you mentioned the pronunciation of ebola, I expected something quite different. In Spanish it is ébola, with the stress on the first syllable and lower case e.
Very interesting, Peter. I’m still wondering where the Americans get the “ee” sound from, since “eh” and “ay” would both seem to be more authentic.